This offer was actually a good fit and good timing for me as I was also able to enroll in the Quick Tier Offer which required 12 nights within 60 days to attain Diamond status. The Quick Trial also gives you 1,000 bonus points for each of your first 6 nights. Just prior to enrollment in the Quick Trial I stayed 3 nights at Aria Las Vegas which counts towards the Hyatt Stay More Play More promo. This left me exactly 12 nights left to get my 30,000 points from Stay More Play more, 6,000 points from Quick Tier Offer, AND Diamond status for the rest of 2015. 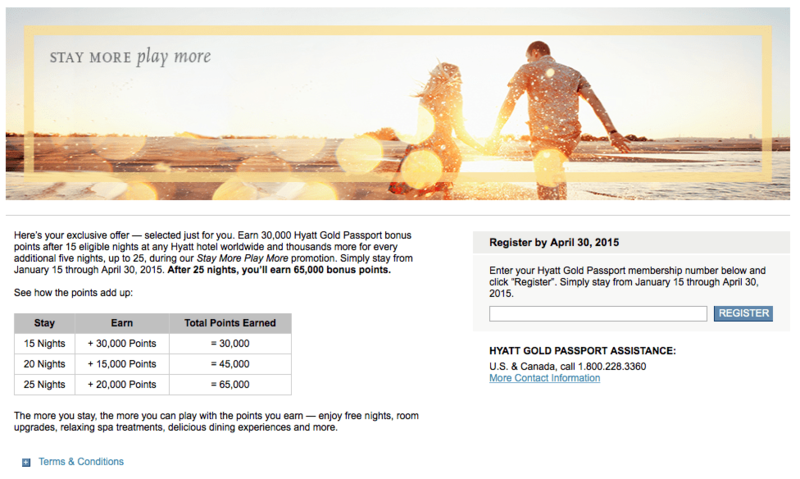 While my Quick Tier Offer concludes on May 15; the Hyatt Stay More Play More ends on April 30. I have two nights reserved in May (going to Vancouver for the first two shows of the U2 tour), however it actually makes more sense to do a mattress run in April at a low cost Hyatt so I can get the 30,000 point bonus. If I need to do it in Seattle (where I live), I can redeem Points + Cash at a Hyatt Place for 4,000 points + $55 per night — or a total of 8,000 points + $110. 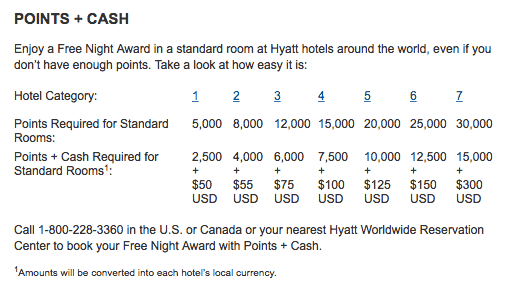 If you value Hyatt points at 1.5 cents, then for $230 (points + cash) I get $450 worth of points. If I was in another city, I might be able to find a Category 1 Hyatt and stay for 2,500 + $50 per night for an even better deal. 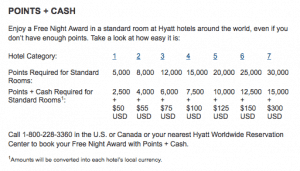 Until July 31, Hyatt Visa holders get 20% points back when redeeming points for free nights (as MommyPoints explains). You just have to register by March 31, 2015. I will be using some Points + Cash redemptions for my Quick Tier Offer/Stay More Play More as these are qualifying nights. In the above scenario, my two night mattress run would essentially be 6,400 points + $110 (valuation of $206). I have already used one Points + Cash redemption and the 20% points back were deposited in my account 4 days after my stay. Also, these stays will all count towards my Diamond status for 2016 (which requires 25 stays or 50 nights). Yes, I’m already thinking about 2016. Update: On April 28th I checked out of my 15th night during the promotion period (12 nights at Hyatt, 3 nights at Mlife). Within 24 hours my new Diamond status (good through Feb 2016) posted as well as 30,000 bonus points (attached the last stay).